Darius was poor game design. Who, in their right mind, gives a tank an executing ultimate that comes off cooldown if it gets a kill? This was poorly designed, and something that the League didn’t need. 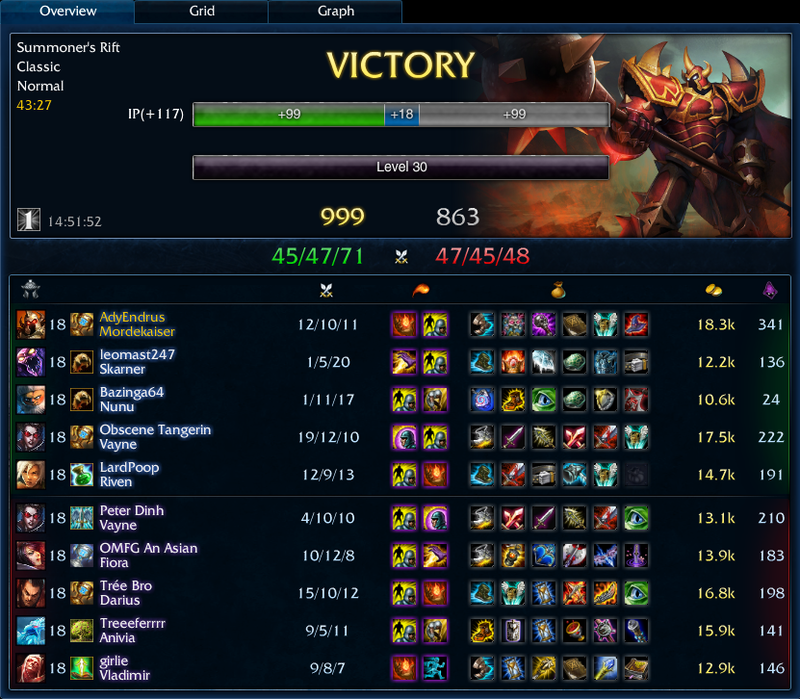 Thankfully, Darius gets wrecked late game by Mordekaiser. Heck, early game I was pushing him around, but after three Fiora ganks before I was level six really set me back. I was so abused by the jungler that I was actually falling behind in creep score. At one point I remember seeing that it was 137 for me to 154 for Darius. Good job having your jungler win you the early game. Maybe go back to the drawing board in development and fix Darius. My favorite part about this game was my 49 magic pen hitting Fiora’s 0 magic resist. She does have 24 from runes, two more from masteries, and 52.5 at level 18 for a grand total of 78.5 MR. That helped me late game as she would just melt with only 22% magic damage reduction. A Fiora ghost is a valuable ally. When they fought us in our base I actually managed to tank three people’s damage while staying just around 100 HP while they dropped. When they finally killed me I ran my Fiora ghost around and it healed me while my GA was bringing me back. I just laughed at the ridiculous damage and spell vamp from that Fiora ghost! We did as much damage to their base as we could, but didn’t want to lose for staying too long. When the next Baron popped Riven and I were in bot lane. We started running to Baron but we knew we wouldn’t get there in time. Nunu tried to run in and ult to steal it, but got interrupted from his ultimate. His Consume wasn’t enough, and the enemy team secured Baron. However, Riven, Morde, and Vayne were ready to rumble. We caught them before they could get out of the Baron pit. Taking Fiora as a ghost we were able to clean up the enemy team quickly. We use a Fiora ghost to tank both mid turrets while fighting an angry bird. After we had the inhibitor down the enemy team started filing out one at a time. This was our chance to capitalize on the enemy team throw. We turn and go all out. The enemy tries to react but Vayne is too much for them. I fall after getting as much damage out as possible. Vayne kills Darius. Vayne kills Anivia. Vayne kills Fiora. Vayne is killing Vladimir and Nunu’s ultimate finishes channeling and steals the fourth kill. Vayne kills Vayne and starts crying on the inside for missing the Penta. Not Vayne’s fault, and it’s hard to blame Nunu when he was doing the right thing to slow the entire enemy team. Still, a Penta is a Penta, and Vayne was robbed of hers. I laughed when I read about the Nunu stealing that last kill for the penta as I have been a Nunu guilty of that, and I laughed even harder when I noticed he only had 1 kill the entire game.